Disclaimer: The kits were sent to us by ‘Tech Will Save Us’ to review; all opinions are our own. Each box includes a cleverly encased micro controller, 3 pots of Electro Dough, cables, the relevant electronic component (motor/ light - in the case of the buzzer, it’s housed within the micro controller casing) and dough shape cutters. There is also an instruction card and free access to the Dough Universe Storybook App. Batteries come included (there is a power preventer tab sticking out of the micro controller battery compartment that needs to be removed to allow the batteries to connect). The boxes themselves are fairly sturdy, however we found it easier to use plastic containers to store all of the components once unpackaged, however the instructions are on card and do not fold easily, so it may be wiser to keep them in the original box all together. As the age on the boxes state 4+, I decided to introduce them to my children (10, 8, 6 and 4) without any intervention from me and allowed them to investigate independently. My 10 year old immediately saw the pictures of the children on the front and assumed it was too young for her. My 4 year old had absolutely no clue what it was, or did, or what to do first and so went off to play with something else. 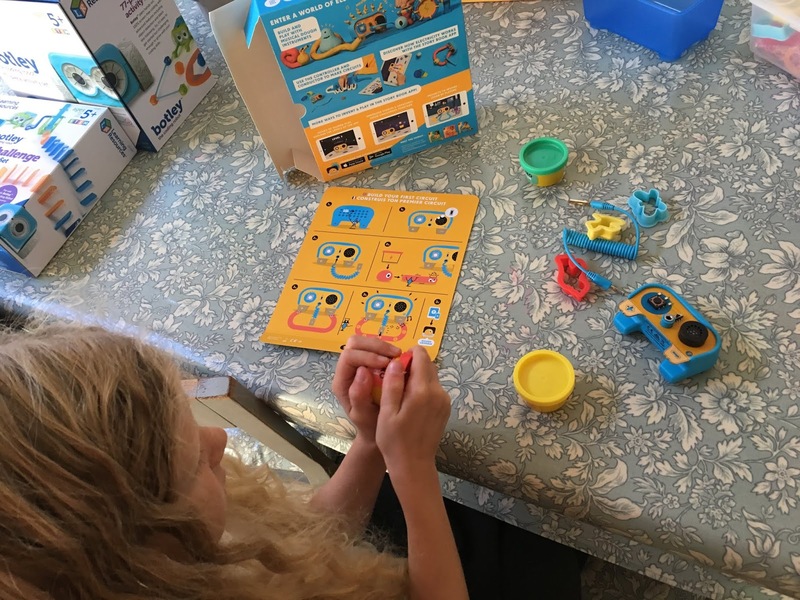 My 6 year old was very inquisitive and began building with the electro dough first, attempting to mimic the pictures on the box. My 8 year old went straight for the electronics and created the circuits first. The idea of these kits is that the dough forms the circuit for the microcontroller to activate either lights, motors or sound, by passing an electric current through the dough (except in the case of the movement kit, where the dough is purely cosmetic). One of the things we noticed straight away (much to my 6 year old’s annoyance) was the dough included in the kits was a) not the same colours as shown on the pictures on the boxes and b) nowhere near enough to create the models demonstrated in the same pictures. Once my 8-year-old had built his circuits and tested them, he began building with the dough, although it became apparent very quickly that it was too soft and malleable to create models with (particularly with the movement kit; it kept falling off/ falling apart) and would often not even stay attached to the plastic or metal components for the kits to function. In addition, the amount of dough demonstrated in the pictures of the light kit meant that the current became too weak to travel through and activate the LEDs (we found this out by combining all the dough from all three kits). In fact, even just 3 LEDs in series was enough to make them hardly light up at all. In parallel, you could get all 6 LED’s lit up brightly, but then this limits the creative shapes you could make (and certainly not the monster shown on the box!). Apparently, you can make your own Electro Dough should you require more, and where we have not tested every brand, other leading dough brands seem to work just as well as Electro Dough at conducting electricity to complete circuits. Thus, you can always add to the amount as needed with your own supply! However, and this suggestion came directly from my children; couldn’t the Electro Dough be more like plasticine? I’m inclined to agree. Plasticine delivers more of a modelling clay feel and although may be tougher for smaller hands to work into shapes, would be much more likely to maintain shape when stuck to a moving part, or maintain a connection to the electrodes without falling off (more like a blu-tac substance). This would create more creativity (heads and wings would not keep falling off) and less frustration. If you think about it, most leading dough products are based on squeezing the dough through things like ice cream machines, icing bags, hair growing toys, cookie/ lollypop makers, rather than sculpting actual models. Therefore, as this product relies on the dough to sculpt with, it definitely needs harder and stickier properties. The microcontrollers are extremely well thought out, as are the motors, lights, and cables. 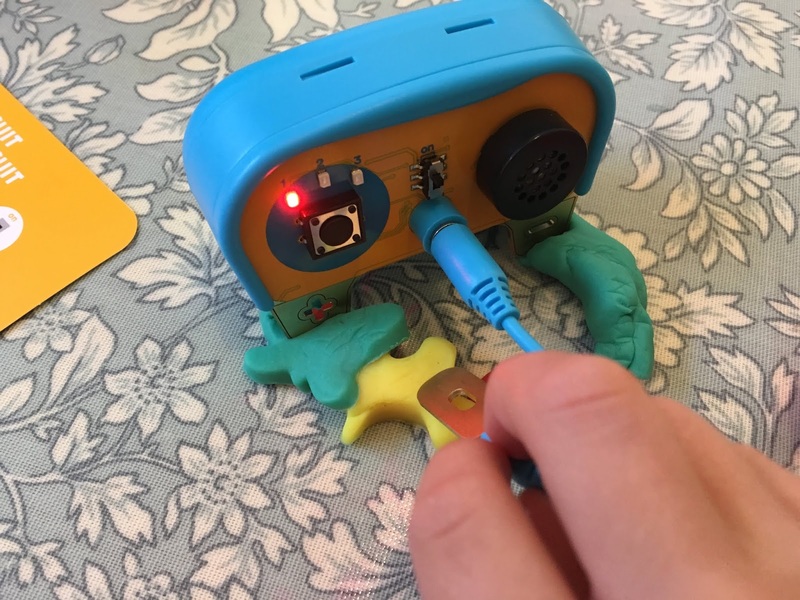 The cables are easy for children to use and do not rely on crocodile type clips, but more secure and robust connectors such as mini jacks. The LEDs and Microcontrollers have very obvious + and – signs on the connector plates (that go in the dough) which are great until they are embedded within the dough and you can’t see which way round the next one needs to go. A child would rarely lay out all the pieces first, then connect with dough, so my 6-year-old found herself constantly uncovering the contacts to see which way round positive and negative had to be. One drawback in the movement pack (as you can see from the video) is that the cable connecting the micro controller to the motor is extremely short. This means the operator has to either chase the motor around at close proximity or the cable literally drags the motor around as the child moves it. The instructions are in pictorial format, which is perfect for younger ones. My 6-year-old was able to follow the diagrams and set up the circuit correctly, which was essential for holding her attention to the project. Considering that any written instructions would need to contain correct technical vocabulary, I think what ‘Tech Will Save Us’ have done here is genius for younger children. The systems were really simple to set up and allowed a certain amount of find-out-for-yourself initiative from the children. As I mentioned before, I allowed them to play completely independently and only observed. You can download the Dough Universe app on iOS and Andriod devices and follow step by step tutorials for each of the three kits. You will need to create a Make Club account in order to access the content. Yes it does, absolutely. The principles behind electronics, creating a complete circuit, power, positive and negative, lights, buzzers and motors all come to life in the child’s hands. By safely being able to get it wrong, trial and error leads to achievement, satisfaction and learning. Both of my children were enthusiastic and delighted when they succeeded in creating something that worked. Add the element of artistic creativity to the mix and you can sustain play and attention much longer than with just the electronics itself. The dough is too soft to sculpt with and maintain decent connections; if you can find a plasticine that conducts, use that! Secondly, the cable for the motor kit needs to be longer. You could probably make a longer cable yourself with a bit of careful soldering, possibly introducing that as a project in itself (Supervised, of course…)! The components were all of a high quality build, robust, and worked straight away. My children were able to get started independently immediately, directly out of the box, with instant success (I’d possibly recommend the age to be 5+ minimum, if we are talking fully independent play). 3 well-made kits, which with a bit of tweaking, could hold children’s imagination and attention for hours, whilst learning all about circuits and electricity. Beware though, the pictures on the box are misleading in many ways! 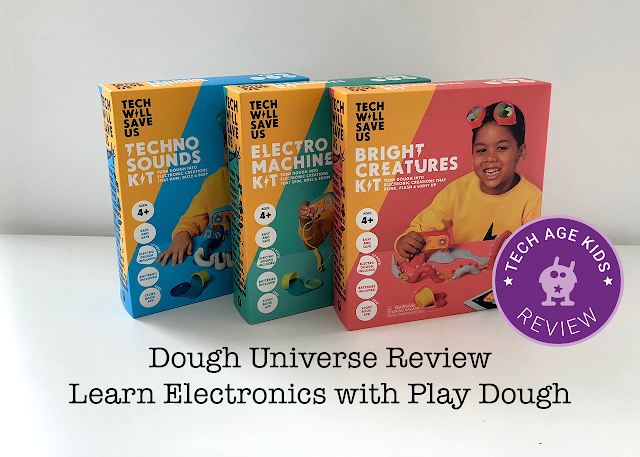 The Complete Dough Universe Pack (all 3 kits) are available from Tech Will Save Us Shop.